IAQA GOVERNMENT AFFAIRS UPDATE: With grateful appreciation to IAQA President Kent Rawhouser and the Board of Directors of the Indoor Air Quality Association, it is my privilege to inform our members that the Government Affairs Committee has been reactivated during the past eighteen months, and already we have celebrated successes influencing local, state, federal, and international policy on the behalf of IAQA membership. The Government Affairs Committee could not have served our organization without the active contribution of numerous member volunteers, more than can be mentioned here. Your Committee for Government Affairs has numerous ongoing initiatives. In this first IAQA Government Affairs Update, there are New York: two bills requiring mold licensing for assessment and remediation have been signed into law by Governor Cuomo. Applications for training providers are being accepted now and all practitioners must have a NY license by 1/1/2016. IAQA has assisted the New York State Department of Labor throughout both the legislative and the rule implementation process by providing research and expertise from our members. 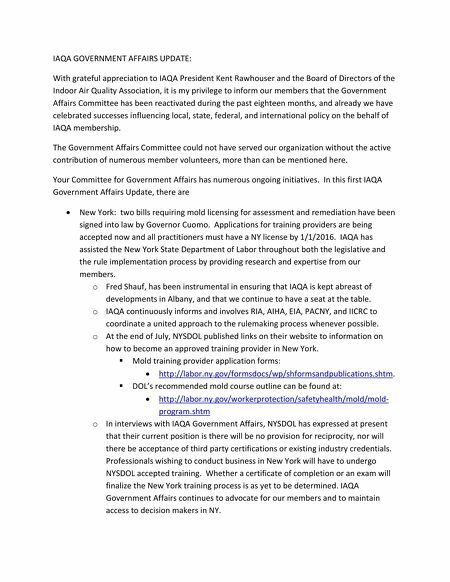 o Fred Shauf, has been instrumental in ensuring that IAQA is kept abreast of developments in Albany, and that we continue to have a seat at the table. o IAQA continuously informs and involves RIA, AIHA, EIA, PACNY, and IICRC to coordinate a united approach to the rulemaking process whenever possible. o At the end of July, NYSDOL published links on their website to information on how to become an approved training provider in New York. Mold training provider application forms: http://labor.ny.gov/formsdocs/wp/shformsandpublications.shtm. DOL's recommended mold course outline can be found at: http://labor.ny.gov/workerprotection/safetyhealth/mold/mold- program.shtm o In interviews with IAQA Government Affairs, NYSDOL has expressed at present that their current position is there will be no provision for reciprocity, nor will there be acceptance of third party certifications or existing industry credentials. Professionals wishing to conduct business in New York will have to undergo NYSDOL accepted training. Whether a certificate of completion or an exam will finalize the New York training process is as yet to be determined. IAQA Government Affairs continues to advocate for our members and to maintain access to decision makers in NY.